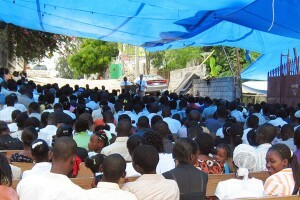 I was sitting up in front of Pastor Diogene’s Port-au-Prince church last Sunday, May 23. As I looked out over the crowd, I recognized very few of the people there. The last time I had been to Haiti was before the earthquake, and then I had known many of the members of this body. Since the earthquake many of those had gone back to their home villages, but they had been replaced by new faces. Before Diogene introduced me to get up and preach, he asked the congregation how many of them recognized me. Very few raised their hands. The benches were full, several people had brought their own chairs, and well over 600 new believers were gathered to hear God’s Word. They were gathered out on the street in front of what used to be the Ebenezer Baptist Church building. That building is now just a pile of rubble – but the church, God’s chosen people, the followers of Jesus Christ, were alive and with open hearts anxious to hear what God’s Word would teach them that day.